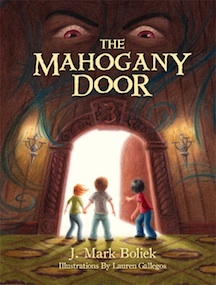 July 12, 2011 (Durham, NC) — “The Mahogany Door,” a new fantasy-adventure book by J. Mark Boliek, accompanied by an all-original soundtrack CD, has received a positive review and strong recommendation from the reputable Midwest Book Reviews (MBR). Out of 1500 book submissions MBR reports that it receives each month, MBR reviewers select only 450 to read. “The Mahogany Door” was one of those and, as such, is placed on the Fiction Shelf of MBR’s July Small Press Book Watch. “The Mahogany Door,” with original illustrations by California artists Lauren Gallegos, is the first title released by Split Rail Books in Durham, NC. 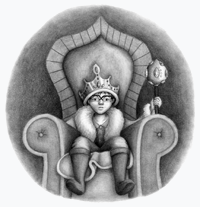 It is the first in a trilogy of books entitled The Bruinduer Narrative, which will continue the friends’ adventures in the fantasy Vryheids world of Bruinduer. “The Mahogany Door” and accompanying CD are currently available through the author’s website, www.jmarkboliek.com. The Kindle® edition is available on Amazon and available for iPad on iTunes and iBooks as well as Nook from Barnes and Noble. The CD is also available for download from iTunes, Amazon Mp3 and many other online retailers. Author: J. Mark Boliek. Publisher: Split Rail Books. Publication Date: May 2011. Genres: Fantasy-Fiction, Adventure-Fiction. Illustrator: Lauren Gallegos. Age Group: 10 and up. ISBN: 978-0-9832900-0-1. Paperback: 353pp. Retail Price: $27.99. Currently available: www.jmarkboliek.com. J. Mark Boliek, the author of “The Mahogany Door” and the entire Bruinduer Narrative series, grew up in Eden and Durham, North Carolina. An avid writer and athlete, he received a football scholarship after high school but chose to join the Navy instead. He graduated from Concord University in Athens, WV, in 1997 and lived in Wilmington, NC, for a while, where he began to develop The Bruinduer Narrative, a fantasy-adventure series for young readers, as well as the soundtrack CD that accompanies “The Mahogany Door.” Mark and his wife Jill now live in Durham, NC, where they own and operate Split Rail Books and Split Rail Multimedia LLC. For more information on the author and “The Mahogany Door,” visit www.jmarkbolief.com and his Facebook page at www.facebook.com/jmarkboliek.